Select the Zoom tool by pressing Z on your keyboard. Type in an angle (in degrees) that represents how wide you'd like your view to be, and press Enter — this is your field of view. For a 45 degree FOV, you'd type 45deg. The larger the angle, the more you'll be able to see. 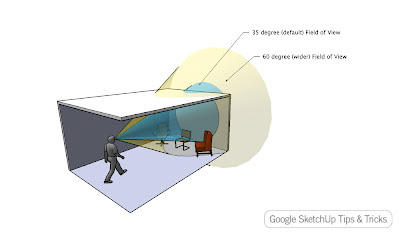 SketchUp's default FOV is 35 degrees, but 60 degrees is much handier for interior views. For a basic illustration of this concept, have a look at this SketchUp model in the 3D Warehouse. If you're into photography, you might like to know that you can also express your FOV as a focal length, in mm. For example, you'd enter a 28mm focal length by typing 28mm (instead of deg after the number). Keep in mind that smaller numbers (like 18mm) yield wider fields of view, while larger numbers (like 300mm) result in very narrow ones. (ie. 55mm)to different or specific cameras? Foe example,a 55mm lens on a 35mm still camera will not have the same FOV as on a 55mm lens on a 35mm film camera. For digital camera's "Film Dimension" is the diagonal measurement of the image sensor. Focal Length is the Actual focal length recorded in the EXIF data of the image. Was just told about this blog tonight and love the articles you have written. A rule of thumb I use: A 50mm lens on a 35mm camera is 'normal' meaning what the average human field of view and that is ~45 degrees. If you double the FOV angle to 90 degrees you halve the focal length to ~25mm and conversely if you want a FOV of 25 degrees you double the focal length to 100mm. All for 35mm cameras only. In my opinion it would be much easier if lenses were labeled as FOV instead of focal length. i understand the field of view and how it relates to the degrees that i type in the lower right corner. where is the control that tells sketchup where to "clip" the foreground? for instance in the old versions of form z I could control the "hither and yon" to see everything up to the point of the cone? That method is fine for the field of view, but how does one get closer to the object, to dramatize the perspective effect?